Leeds Rhinos (‘the Club Management’) reserves the right of admission to the Ground. All matches will be played in accordance with the rules and regulations of The Rugby Football League (‘RFL’) and their respective laws of the Game. Play cannot be guaranteed to take place on any particular day or at any particular time and the Club Management reserves the right to change its advertised fixtures without notice or liability. At the Club Management’s discretion, refunds may be made in respect of tickets sold and paid for in advance of a match, where such match is postponed. This is subject to a time limitation, the details of which can be obtained from the Club. i) Considered inappropriate, offensive or distasteful. ii) Considered dangerous either to their own safety or the safety of other spectators. iii) Considered an obstruction to the view of the spectators. b) Any person who refuses to be searched by any servant or agent of the Club. The following items are not permitted within the stadium and may be confiscated: fireworks, smoke canisters, knives, bottles, glasses, cans, flags, banners, poles, similar articles and containers which might be used as a weapon or missile, stools, crates, fold-up chairs, pushchairs and children’s car seats. It is an offence to use foul and abusive language, obscene chanting or racial abuse. Action will be taken against any individual(s) indulging in such acts. Unauthorised persons are strictly forbidden from entering upon the field of play, unless advised to do so in an emergency. Individuals entering upon the field of play without permission may be charged with aggravated trespass and will be banned from the ground. The obstructing of gangways, access ways, exits and entrances, stairways and similar places and standing in seated areas whilst play is in progress is strictly forbidden. The climbing of any structure within the Ground is strictly forbidden. Unnecessary noise such as that from the use of audio equipment and behaviour likely to cause confusion or annoyance to any person is not permitted in any part of the ground. Any person attempting to gain admission to, or being found within, a section of the Ground designated for ‘Members Only’ without the appropriate authorisation may be ejected from the Ground. With the exception of persons authorised by the Club Management and Press Representatives holding official passes, the taking of photographs or video footage inside the Ground is prohibited. In addition, recording for Radio, Television, Internet or for private purposes, whether for transmission or otherwise, is not permitted except with special authorisation in writing by the Club Management. Only persons specifically authorised in writing by the Club Management are permitted to distribute either without charge or offer for sale within the Ground any newspapers, periodicals or any other articles. Any person found damaging or defacing property within the Stadium will be prosecuted. Persons failing to comply with instructions from a Steward or other authorised agent of the Club may be ejected from the Ground. The Stadium Management reserves the right for its servants and agents to remove from the ground any person who does not comply with these Ground Regulations, the Rules and Regulations of the RFL and the Safety of Sports Grounds Acts 1975 or whose presence within the Ground is, or could, reasonably be construed as constituting a source of danger, nuisance or annoyance to any other person. On all Rugby Events at Emerald Headingley Stadium the importation of alcohol is forbidden. All young persons have a right to be safe and enjoy sport at Emerald Headingley Stadium. Please ensure that children under 16 are accompanied by a responsible adult. All Junior Season Memberships purchased in the South Stand must be purchased with an Adult Season Membership. In the event of an incident involving the junior, the adult will be held totally responsible. Smoking is only permitted in the designated smoking areas – this includes electronic cigarettes. We treat electronic cigarettes as lit cigarettes. All attendees at the stadium consent to being filmed or recorded (images and sound) by or on behalf of us, the Organiser or another authorised third party, and consent to their images (or likenesses) being used in any film, recording, photograph or other footage (“Recording”) of the Event. All rights in the Recording shall be owned by the Organiser, authorised third party or us absolutely. You agree that any Recording may be used by us, the Organiser or authorised third party in any media and for any purpose throughout the world, including, without limitation, for promotional materials and activities, merchandise, DVD’s or other commercial activities. No payment or compensation for use of your image or likeness shall be payable to you. All persons entering the ground are admitted only subject to their acceptance of the above Ground Regulations. Entry to the ground is on this condition and if you are in breach of the rules and regulations you will be removed from the stadium. ALL BREACHES OF GROUND REGULATIONS WILL BE ASSESSED AND INVESTIGATED BY THE CLUB. THE ACTION TAKEN WILL BE DETERMINED BY THE INCIDENT SEVERITY. N.B. All Leeds Rhinos fixtures are subject to change – please ensure you check on the website prior to attending. Leeds Rhinos take the safety of our supporters very seriously. 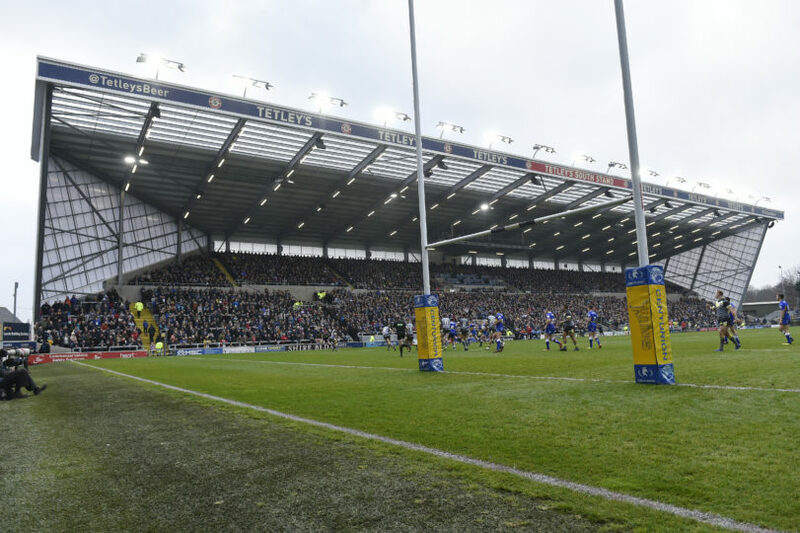 Under a recommendation from a security aspect, we have made important changes to help ensure the safety of all supporters, visitors and staff at Emerald Headingley Stadium. These include enhancing the searching of supporters at the turnstiles on a matchday. This means that entry to the stadium may take longer and as a result it is likely that queues may occur, however we will do all we can to keep things moving. We are requesting that supporters do not bring bags to the stadium to avoid these search processes. This policy addresses issues such as the importation of alcohol into the stadium, the delivery of potential weapons or pyrotechnics and includes measures to adhere to our prevent terrorism incidents. It has been recommended to supporters to bring nothing larger than an A4 piece of paper. If supporters bring rucksacks or backpacks which are bigger than the recommended size they will be searched and tagged. If they are deemed to be too large, they will be searched, tagged and taken to a secure area for the duration of the match and are to be collected after the match. If a bag is seen inside the ground without a tag it will be necessary for it to be searched and left in a secure area for collection after the match. Searching of bags will only be conducted by appropriately qualified SIA-badged personnel. No bags held by under 16s will be searched without the prior approval of the person’s parent or carer. Bags will be retained at the ticket office for the duration of the event or until collected by the spectators on departure from the stadium. The Club takes no responsibility for the bags or its contents in the period that it remains on the Club’s premises. The Club retains the right to search any spectators entering the stadium. This is referred to in the stadium’s regulations and permission to be searched is granted by a spectator when they purchase a match ticket. Any supporter that subsequently refuses to be searched will be refused admission to the stadium. The Club will make no refund on any ticket purchased to spectators who is denied admittance due to a refusal to be searched. All searching will be based on live assessment at the point of entry but the Club reserves the right to introduce a 100% searching policy on personnel for any event or at any time during an event. All personnel searches will be conducted by suitably qualified SIA-badged personnel. All searches will be conducted on a gender specific basis and, in particular, searches on female spectators should be carried out only by female staff. Searches on spectators aged 16 or less must not be carried-out. However, with a parents or carer’s prior approval, it is possible to request that the spectators conduct a self pat-down to identify any items that are in contravention of the ground regulations. For the avoidance of doubt, the ground regulations stipulate the following items are not permitted within the stadium and may be confiscated: fireworks, smoke canisters, knives, bottles, glasses, cans, flags, banners, poles, stools, crates, fold-up chairs, pushchairs, children’s car seats and other similar articles and containers which might be used as a weapon or missile. These search measures have been introduced to try and ensure spectators can enjoy a safe environment while watching their sport and pastime. Club personnel and their agents will deliver this policy firmly but politely with understanding. The support of all supporters in delivering this policy successfully would be much appreciated.